What an extremely fast year it has been in downtown Cedar Falls, Iowa! Our store is filled with unique merchandise and a cool atmosphere. Original old tin ceilings, restored brick walls, stone walls and even a wood floor….this building oozes in charm and character. Get your girls together and join us for a Girls’ Night Out in downtown Cedar Falls! Enjoy a fun evening of shopping, dining and making memories the first Thursdays in May and October from 5-8pm in downtown Cedar Falls. The downtown merchants pull out all the stops with great discounts, awesome deals, free samples, prize drawings and more. Enjoy a fun day of free, fall-themed family activities in downtown Cedar Falls! Activities include face painting, pumpkin painting, kid’s activities and more. A long-standing community tradition, preschool to 6th grade children are welcome to trick or treat at participating merchants from 3:30 to 5:00 PM on Halloween. You bring the tricksters, we’ll provide the treats! 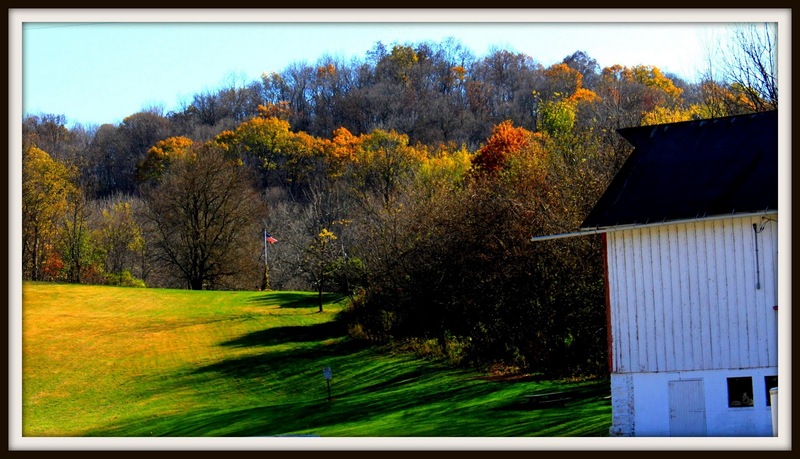 Beautiful end of fall season shot taken at Paradise Valley Campground near Garnivillo, IA. 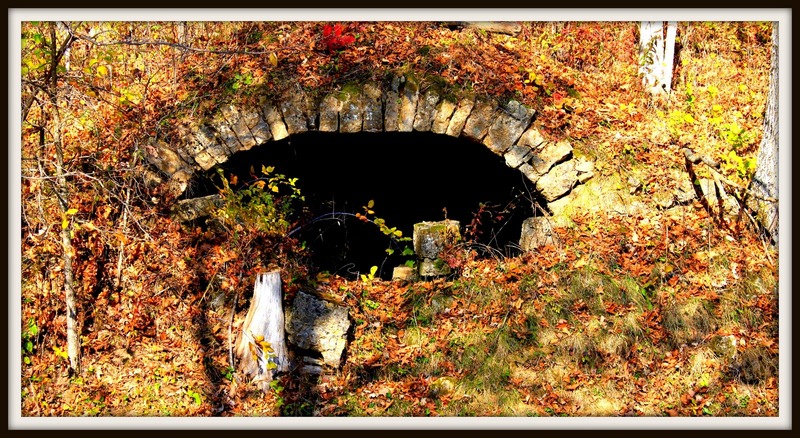 Old stone bride found on the site…love the intricate detail of the stone work with the beauty of fallen tree trunks and leaves surrounding it. 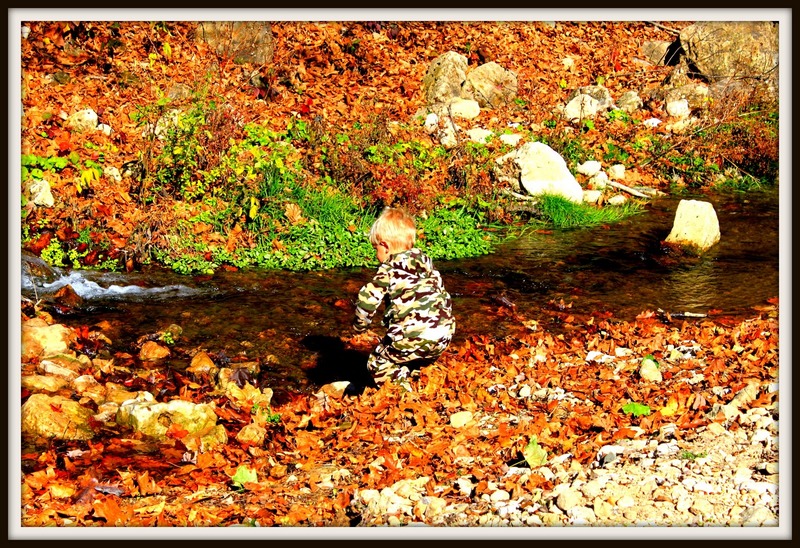 Little Jay playing in the stream…(my friend’s son). He is so precious! 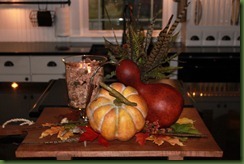 Fall Kitchen Island centerpiece in 5 minutes or less! 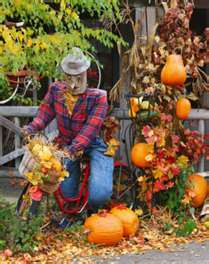 Not wanting to dig thru the attic this year dragging out all my fall decorating so I came up with this 5 minute idea. Yes behind this grouping you get a sneak peek of my newly remodeled kitchen that I will post about soon! First I placed a Pottery Barn rectangle cutting board. 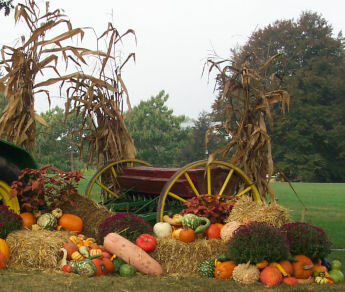 Then I set one faux pumpkin and gourd. Behind that I placed an antique amber glass and filled it with pheasant feathers the kids have collected along with my brother over the years…thanks guys! To the left I placed my Taste of Home Entertaining Glass Hurricane and filled it with crushed up wine corks I bought at The Little Red School House in Independence, Iowa. I nestled down inside the corks a Bath & Body Works fall spiced candle. To finish it off I scattered faux leaves from Crate & Barrel and some more of my pheasant feathers. That’s it…very easy and simple! You need to make this wreath…. The Magic of Ordinary Things made this fabulous wreath using fabric scraps….yes I said fabric scraps! 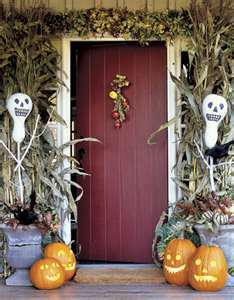 You need to go check her blog out for the tutorial on how to make this MUST HAVE wreath for Fall. What can you do with colored popcorn? What can you do with colored popcorn? Put it in a curvy glass jar that’s what! If you can’t find colored popcorn, twist off the kernels from indian corn. I like to sprinkle cinnamon oil on it them to give my home a pleasant scent. Insert a candle and enjoy the ambiance. Another so simple project you can do! Do you have an abundance of apples? 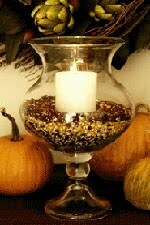 Well why not display them in a pretty container that has been nestled with burlap or muslin fabric. 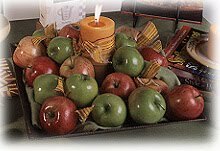 Insert a fall colored pillar candle in a warm and inviting scent like caramel apple. Tie a coordinating ribbon around pillar top that is out of the way of the flame! Make small 3 inch tufts of ribbon and poke in randomly for added color and texture. This might make you want to eat healthy! After all these are so gorgeous and tempting, aren’t they?! accessories, fashion clothing and jewelry, and gift items. Give your home, office, or urban living a designer flair at affordable prices!